Well have just finished and uploaded the Xmas newsletter, was great fun deciding which of our many pics to put up. Have been making spiced pear pickle this afternoon to give as a homemade Xmas gift so the house smells very lovely. We had our Xmas party last night which was great fun, Ellie got home just in time before Birmingham station was closed due to snow. 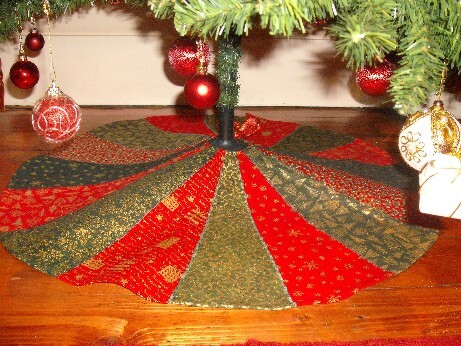 I finished the tree skirt off on Friday so thought I would show you some pics of that. 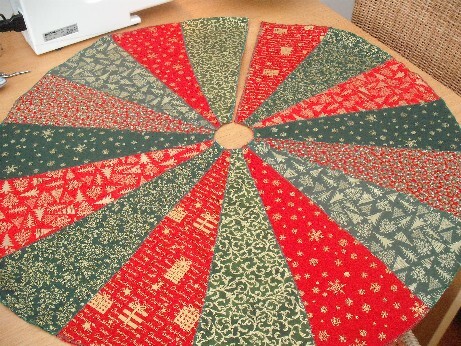 I cut round a circular mat I have to give me the pattern – I used some red cotton that I had in my stash – then folded this into 16 to give me the template for each piece. I cut a slit in the backing fabric so that I could put it round the tree.I used eight different Xmas fabrics, cutting two segments from each and ironed bondaweb on to the backing fabric then ironed all sixteen pieces on evenly spaced. I then cut a small hole in the centre and zigzagged over all the joins. I didn’t put any wadding between the layers though you could if you wanted it thicker. I then hemmed it all and added a ribbon and voila here it is under the tree! It looks very pretty - just waiting for the pressies now! I have taken a couple more pics of the tree just to show you a couple more of my unique ornies. Here is one that I did show you last year – an exchange that I got from the USA, it got delayed due to bad weather so never made it to the tree but here it is this year. 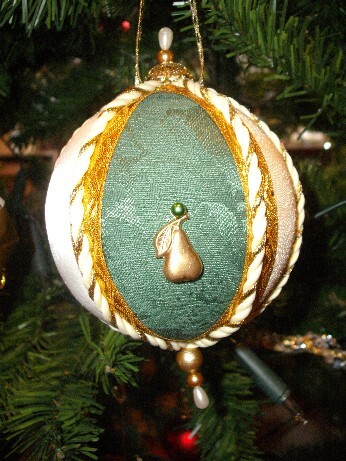 The pic below is one of my new crop of baubles for this season – I love making these! 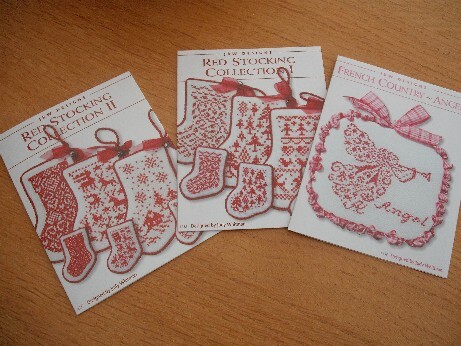 As I mentioned in my last post I want to stitch more ornies next year so I have ordered these three below from Sew and So – I still have another two that I ordered previously that I have not made yet, a tree and an Xmas pudding and am also going to make myself versions of the lovely ornies I have given away over the last few years. My aim is to complete one a month during 2011 so I will be posting details of how I get on over the year. Once I have finished sorting out the house for Xmas I will snuggle down on the sofa with some mulled wine and make a start! Well I do hope you have nearly finished your preparations for the festive season. We have got a packed week planned, with visits to the cinema and to an exhibition at the Trafford centre of replicas from Tutankhamun’s tomb, then all the relatives arrive Weds and Thurs for the duration. In between I have a whole lot of marking to do! 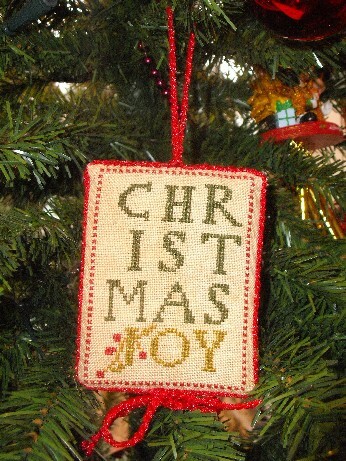 Hope you have a very, very lovely Xmas with lots of time for relaxing and crafting. Ellie and I plan to do nothing in between Xmas and New Year except sit, knit and watch girlie movies – heaven!